Botryoidal or Bubble This literally means “cluster of grapes” and is used to describe a cabochon that has a bumpy or grape like surface. Brecciated A gemstone composed of fragments of different minerals in a matrix. Cabochon (also known as Cab for short) Usually a semi precious stone cut for jewelry. A cabochon is usually rounded (or domed) and polished on top, and either flat or slightly rounded on the bottom. 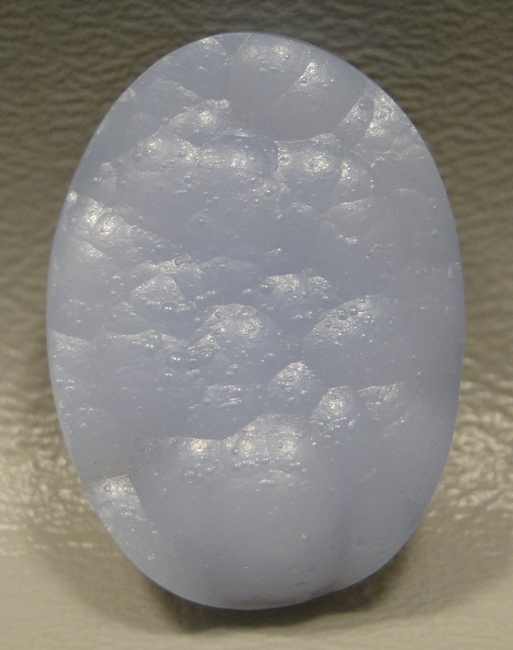 Cabochons can be calibrated (cut to a certain size/shape) or freeform (an abstract shape). This form of cutting is usually used for opaque or translucent semi precious gemstones, but is sometimes used for transparent gemstones with too many inclusions to make a good faceted stone (faceted is the way diamonds are cut with tables and angles). Cabbing or Cabber are often used to describe the action of cutting a cabochon and the cutter. A Lapidary is somebody who cuts and polished stones. Calibrated When a gemstone is cut to a specific standard size. For instance the 30 mm by 40 mm oval cabochon. Jewelry stones cut this way can fit into ready made settings and do not need to be custom set. Chatoyant/Chatoyancy Chatoyancy is a lustrous, cat's eye effect seen in some gemstones and minerals. 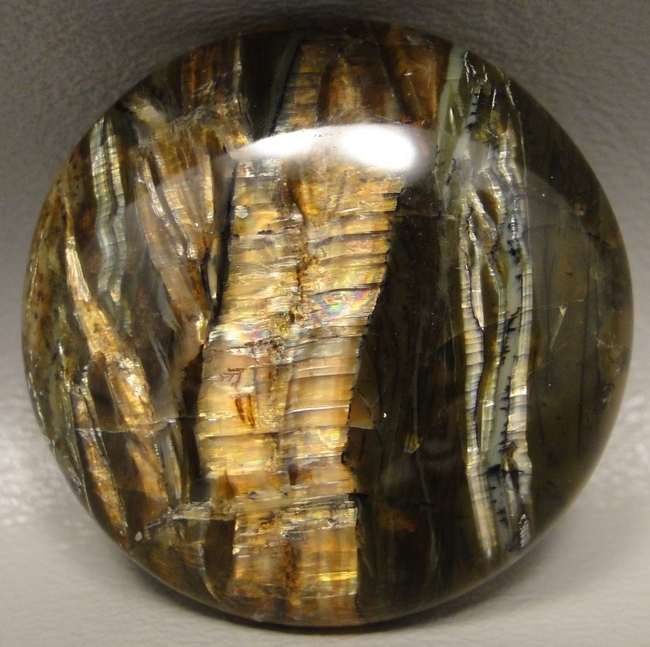 In chatoyant material, light is reflected in thin bands within the mineral or stone. Chatoyancy arises either from the fibrous structure of a material, or from fibrous inclusions or cavities within the stone. The name comes from the French word for "cat's eye," because it resembles the slit eye of a cat. Dendrites, Plume, Moss Used to describe the formation of inclusions in a gemstone, usually agates. Dendrite means tree like, plume is usually feathery, and moss is mossy looking. Drusy or Druse or Druzy Drusy is a layer of crystals that formed within a cavity of rock. 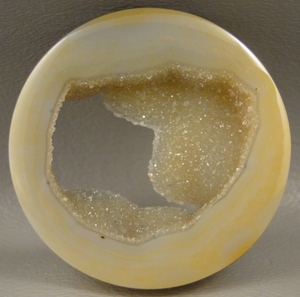 The inner cavity of agate geodes is often lined with tiny sparkling quartz crystals. These crystals reflect (or appear to be) the color of the rock underneath. Sometimes in the trade minerals that have a fine layer of tiny sparkling crystals can be referred to as druses, such as Cobalto Calcite being called Pink Drusy, or Uvarovite Garnet being called Green Drusy. These minerals can sometimes be cut into designer crystal cabochons for jewelry. Flaw A flaw is an imperfection in a gemstone or rock. Flaws include: cracks, chips or “dings”, and some natural inclusions or fractures. A flawless gemstone is called "clean”. Flaws can sometimes greatly reduce the value of a gemstone. Fossil The term fossil refers to any preserved remains or imprint of a living organism (usually ancient), such as a bone, shell, footprint, or leaf impression. The organic matter is replaced by minerals such as silica, calcite, carbonates and iron. Often even the most minute details of the original item was preserved. Fracture A crack in a gemstone or rock that can be natural or man made. It can be naturally healed, meaning something happened, perhaps the ground shifted and cracked, and then the crack was filled with natural material. Freeform Refers to cabochon stones that are a non-standard or specific shape. Usually it is not symmetrical. Hardness The Mohs scale of mineral hardness rates the scratch resistance of various gem stones on a scale of 1 to 10 It rates the ability of a harder material to scratch a softer material. The scale runs from 10-Diamond, the hardest substance known to man, to 1-Talc, the softess. Though diamond is the hardest, jade is actually the toughest, or least likely to break. High Grade/Mine Run High Grade material is exceptionally good. Also to “high grade” a mineral collection is to sort out the best specimens. Mine Run is usually used to state that the material is sold as it comes out of the mine. The good and bad mixed, it has not been sorted or "high graded". 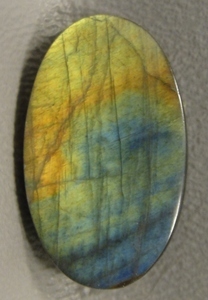 Irridescent/Labradorescence An iridescent cabochon displays many lustrous, changing colors. Iridescence or labradorescence is caused by dispersion of light in cracks and flaws resulting in a rainbow-like play of color (as often seen in an oil slick or a soap bubble). The colors tend to change as the angle of view changes. The word comes from the Greek word “iris”, which means rainbow. Inclusion An inclusion is a particle of foreign matter contained within a mineral or gemstone. Inclusions can be solid, liquid, or gaseous. A water filled pocket is called an enhydro. Organic inclusions are only found in Amber. Inclusions are natural and not always considered flaws in jewelry stones. Luster The appearance of the surface of the gemstone caused by light reflection. The most common is vitreous (glassy), the most desirable is adamantine (diamond like). Other types are metallic, pearly, silky, waxy, and dull. Matrix A common rock in which a mineral or crystal is embedded in. Metaphysical Properties The belief in healing stones, healing crystals, or the magical properties of gemstones and minerals is not new. Belief in the supernatural properties of rocks and minerals bringing peace, wellness and protection goes back beyond recorded history. There are ancient legends that trace rocks, minerals and crystals back to the creation of the Earth and the Universe. Orbicular, Eyes Refers to circles or orbs in the pattern, usually found in jasper stones. Opaque Opaque means no light passes through the semi precious stone. Psuedomorph When a mineral changes into another mineral in every respect, except its outer former shape, which stays the same. Sheen The way a mineral reflects light can be affected by characteristics just below the mineral's surface: for example, the pearly sheen caused by partly-developed cleavage(s) parallel to the surface; the silky sheen from a fibrous growth structure or parallel hair-like inclusions. Synthetic Is the term given to gem stones that are man-made. Stabilized/Treated An impregnation of a resin to make the stone harder or more durable, so it can be cut into a cabochon easier. This does not effect the attributes of the stone-such as its color. "Treated" can also refer to a process done to change the stone cabochon's attributes, such as heat-treating, irradiation, dyeing, etc. Suite Cabochon stones custom cut to be used together, in one piece of jewelry or in matching pieces: like a pendant and earrings. Also called a cabochon set. Symmetrical A standard geometrical shaped cabochon where the sides are mirrored images. For instance square, rectangle, circle, oval, tongue, etc. Translucent/Transparent Translucent cabochns allow some light to pass through them, but the light is diffused. The material appears to glow. Transparent means clear or light shines freely through the cabochon. Vug This is a natural hole or hollow area in rock. Also called a pocket or cavity. Can sometimes be filled with crystals, referred to as a geode.